The Clear Lake area and the League City/Friendswood/Pearland region are among the fastest growing sections of Texas. The communities can attribute their growth to affordable housing, outstanding, safe neighborhoods, award-winning school districts, 35 miles of waterfront property and a desirable central location between downtown Houston and Galveston. The region boasts outstanding neighborhoods, a low crime rate, low unemployment rate, above average income levels, cultural events as well as recreational facilities in boating and water sports, golf and tennis, and the full range of amateur sports facilities. At the epicenter of these communities is NASA’s Johnson Space Center, established in the 1960s across from Clear Lake. Cities and neighborhoods in the region today offer a wide variety of dining, shopping, entertainment and outdoor activities. The Bay Area and the communuties along the southern edges of Houston are only a few minutes from Galveston’s beaches and Houston’s thriving commercial sector, professional sports arenas and cultural treasures. With a great historical heritage, great communities and wonderful lifestyle, these areas offer the "best of both worlds." With more than 200 acres of parkland connected by a hike and bike trail, Seabrook hosts marathons and fun runs all year long. It also is designated a bird sanctuary on the Clear Lake Loop of the Great Texas Coastal Birding Trail, where more than 300 species of birds have been identified. With more than 7,000 recreational boat slips, the Clear Lake region is the nation’s third largest boating mecca. The Kemah Boardwalk features an amusement park and an array of dining experiences alongside Galveston Bay which, attracting more than 4 million visitors a year. Surrounded by water, this small island community boasts more boat slips than people, with golf carts being the favorite mode of transportation. With waterfront housing along Taylor Lake and Mud Lake, this forested neighborhood dates back to the early days of the Johnson Space Center. Some of NASA’s earliest astronauts, including John Young, Neil Armstrong and Buzz Aldrin, once lived in El Lago. An “Astronaut Wall of Fame’’ is featured in City Hall. Once known as Clear Lake City before the city of Houston annexed it in 1977, this area of more than 3,000 acres is the second largest master planned community in the Houston area. It borders Armand Bayou Nature Center, one of the nation’s largest urban wildlife refuges. Located across from Space Center Houston, this neighborhood features the Nassau Peninsula, an environmental conservation area. Space Center Houston, the official visitor center to the Johnson Space Center, is in Webster, also home to more than 20 hotels. The newest feature is the space shuttle Explorer mockup, a full-scale, high fidelity replica of the Space Shuttle, parked outside Space Center Houston. The largest and fastest-growing city in Galveston County, League City is home to the third largest boating anchorage in the U.S. It also boasts Big League Dreams Sports Park, a world-class amateur recreational sports facility, a resort and conference center, three golf courses, 14 baseball fields, 16 soccer fields and 11.5 miles of trails with a plan to grow to a network of 212 miles of trails when complete. Founded by Quakers in 1895, Friendswood consistently has been named one of the top small cities to live in the United States. Expansive Baybrook Mall, featuring top-end shopping and dining, lies in Friendswood, just west of Interstate 45. Friendswood was named the 20th Safest City in USA in 2013 by Neighborhoodscout.com. Money Magazine named Friendswood as one of the Top 100 best places to live in US in 2007 and 2009. The city was listed in the Best Affordable Suburbs by Business Week Magazine in 2009. One of the fastest growing cities in Texas, this thriving community increased from approximately 19,000 to more than 100,000 residents in the last two decades. 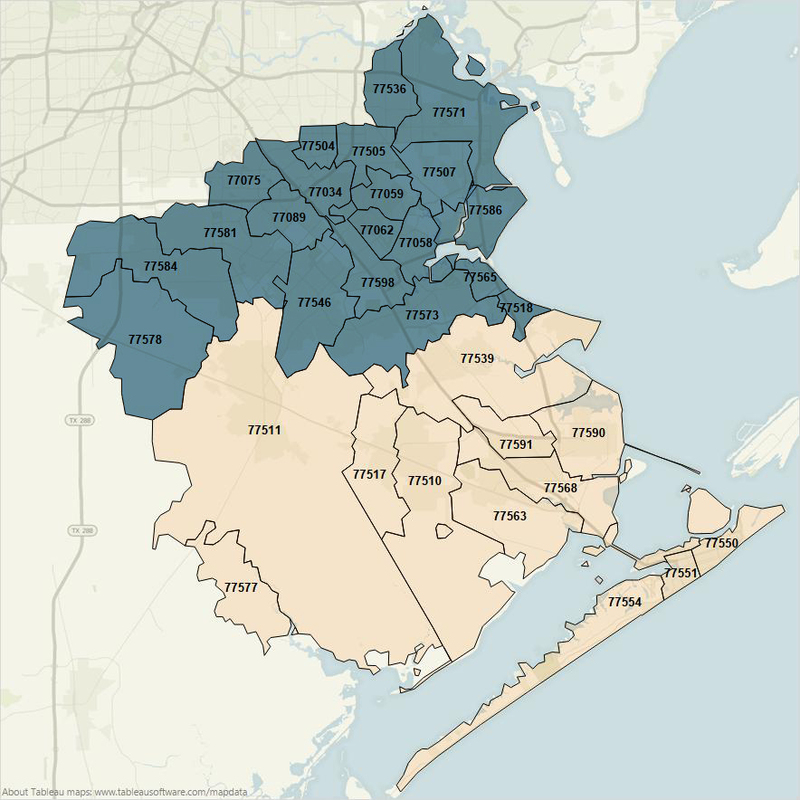 From million dollar homes in master-planned communities to historic homes in the Old Town District, the number of single-family housing units in Pearland has increased substantially over the past few years, now totaling approximately 90,000. Pearland has been named the fastest growing large retail market in Texas by the Texas Retail Survey. Pearland is also the fastest growing city in Houston area and the second fastest in state of Texas. Click the name of the school districts below to expand their information. The Clear Creek Independent School District is home to explorers and adventurers! Nestled along the NASA Johnson Space Center in Houston and the boating waters of the Gulf of Mexico, Clear Creek ISD proudly serves the educational growth of more than 39,000 students and continues to be one of the most desirable places to raise a family in the Greater Houston area. Clear Creek ISD is the 29th largest school district in Texas, out of 1,031 districts. The district spans 103 square miles, 13 municipalities and two counties (Harris and Galveston). They pride themselves on involving their stakeholders in making curriculum, finance and policy decisions. All decisions are made with the best interest of children in mind. Clear Creek ISD’s completion rate is 98.5 percent, and more than 96 percent of all high school graduates attend college, enroll in the military or enter the workforce. CCISD students score well above the state and national averages on state assessments and college entrance exams. FISD is proud of talented and dedicated teachers, a strong curriculum, parents who value and support education and students who are ready to learn. The district's goal is to take its efforts to a higher level and demonstrate to the nation just what is possible! Friendswood ISD is a unique school district, located next door to the fourth largest city in the United States and surrounded by large school districts. FISD is in a great location for enrichment learning in Space, Engineering, Medicine, Marine Biology and Petrochemical areas. The Friendswood Independent School District was established on Dec. 21, 1948; it covers 15 square miles and borders the Alvin, Pearland and Clear Creek school districts. A Quaker heritage that focused on church, family and schools still remains as a way of life for the community of Friendswood, and it still continues to shape the character of the area. Education is a top priority, and Friendswood ISD is an award-winning district with quality faculty and staff and tremendous community involvement. Through all the years of growth in Pearland, the school district has consistently been the heart of the town, according to the district's web site. The first school, built in 1893, was a one-room wood structure with a woodburning stove and an enrollment of 23 students. More than a century later, the district has 23 campuses, 1198 teachers and an enrollment of close to 20,000. The Clear Lake area and communities to the west offer a wide variety of home and housing choices. Check the resources below for current information, including current listings for home sales and rentals, for this region. Please read our disclaimer about the links below, and visit our links page for additional information and tools related to relocation.